Cold water shaving has always had a small following amongst enthusiastic home shavers. But it’s never been offered in barbershops, other than those with no hot water supply! Why would we offer as a professional service something that not only goes directly against the accepted shaving wisdom, but is something that most men are going to think is actively unpleasant? These men are going to take some convincing – but first I need to convince you that cold water shaves (or Ice Cold Shaves as I prefer to call them) are a viable alternative to the universal Hot Towel Wet Shaves. Let’s start by looking at the theory. 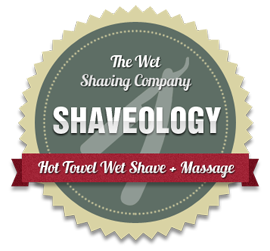 If you offer professional shaves the overwhelming odds are that it will be a hot shave – hot water, hot towels, hot lather. And why not? The accepted wisdom is that hot is the only way to shave. The traditionally held view is that hot water is best for shaving. The theory is that hot water and soap strip the bristles of their thick oily protective covering, and open the cuticles on the bristle as well. This makes the bristle very absorbent, and the more water it absorbs the softer it gets. This is all beyond refute but the next conclusion is the contentious one – that a soft bristle is easier for the razor to cut than a hard one. The secondary result of using hot water on the face is that it makes the skin more pliable. Again, you can’t argue with that, but the benefit of this is that, supposedly, it makes to skin easier to stretch taut (tightly stretching the skin makes to bristles stand up). Proponents of cold water shaving would argue that this traditional view is flawed in both respects. A soft bristle will bend before the blade, either slipping underneath the cutting edge or getting cut halfway through then bending which results in tearing and pulling. And if you want to pull the skin tight, what is the advantage in making it looser or baggier before you do it? I must admit that this actually makes a lot of sense. We do accept an awful lot of what is accepted as traditional wisdom without questioning whether the actions necessarily lead to the stated result. If we look at the anatomy of the skin we can see that sebum is produces in the hair follicle. This travels up the hair shaft and acts as a natural moisturiser for the hair and skin. Attached to each follicle is the arrecteur pili muscle which controls whether the hair is lying flat to the skin or standing up (this is part of the bodies temperature control system). From a shaving point of view hot water and soap are going to strip the bristles, and skin, of sebum. While this is undoubtedly going to make the bristles softer, it’s also removing a layer of natural lubricant from the skin. It’s also going to relax the arrecteur pili muscle, causing the bristle to lie flat on the skin. Connective tissue is also going to relax, due to the warmth stimulating extra blood flow. One of the most neglected elements of shaving is the fact that the tighter you can get the skin, the smoother the shave. This is down to two things – one, it pulls the bristle up and two, it smooth’s out any lumps and bumps. So if you’re introducing warmth into the skin and loosening it you are making the stretching more difficult. Plus if you encourage more blood to the surface of the skin you make all the little lumps and bumps more pronounced and easier to catch with the razor. The effect of the hot water on the hair is to open the cuticles, allowing water into the cortex and softening it. Once the cuticles are open the hair loses some of its rigidity and, along with the water absorbed into the cortex, it becomes much softer. This allows it to bend before the razor, but why would this make it more difficult to cut? Think of the difference between trying to slice through a nice crusty French stick and a soft roll, which one gives you the cleanest cut edge? If you use cold water on the skin you not only keep the bristles rigid but the skin tightens and the bristles naturally stand up, perfect for shaving. So, that’s the anatomy and theory. How does a cold water shave differ in practice? Wet face thoroughly with cold water, as cold as you can stand it. Lather face with a quite watery lather. Massage this into the beard area. This is to ensure that the face gets really wet. Lather up again with a stiffer lather. Shave mostly across the direction of growth in short strokes, whilst holding the skin tight with the other hand. For me this will be in towards the nose on the cheeks, down on moustache and bottom lip, outwards across neck and chin. You will find that there is more resistance to the razor, and you will hear more of a rasp as the bristles are cut. This doesn’t mean that it is pulling more, only that the bristles are harder and the razor is cutting them more cleanly. If you think it’s uncomfortable for your client, ask them! They’ll tell you it’s different, but not pulling or tugging. Splash face with cold water. Massage a little shave oil into face and feel for rough areas. Shave these in a different direction than the first pass. For most of us this will give a shave as good, if not better, than your normal hot water shave. For most men who go for barbershop shaves it is not just about the purely functional removal of beard hair. It’s the whole feeling of plugging into an earlier, less troubled, rushed time, it’s a timeless routine, almost a meditative, zen experience (apologies, my inner hippy has now been securely gagged again!). How can a rather Spartan cold water shave compete with hot water and steaming towels? It can, but you’ll need to sell it. So how are you now going to sell this alternative shave to your clients? There are two main selling points. Firstly, anyone who won’t have a shave because their skin is ‘sensitive’ or irritates easily, and those guys who are a nightmare shave – the ones who always get little nicks and blood spots, will really benefit from an Ice Cold Shave. Not using heat is going to cut down on irritation and sensitivity, and not bringing blood to the skin is going to keep any lumps and bumps much lower in profile, leading to less blood spotting. Secondly, stress how refreshing this shave is! On a hot day your clients might not want a hot towel shave, but persuade them to try this – they’ll love it. This is also a great hangover cure, reduces puffiness in the face and will leave them feeling invigorated. So, are there any other benefits of cold water shaving other than the quality of the shave? Most certainly yes! The biggest one, and the reason I advise most guys to try it, is that it hugely reduces post-shave redness, irritation, razor rash and burn and even ingrowing hairs. A lot of the redness and irritation suffered by guys after shaving is down to the heat put into the skin – even a cold flannel applied after a hot shave will help reduce this. But if you regularly suffer with nicks, razor rash (folliclitus) and razor burn then cold water shaving will really help. Less irritation is going to be suffered because you have to go over each area fewer times. As you haven’t introduced heat the skin can be pulled really tight and flat, so any lumps, bumps and scarring are less likely to be caught by the razor. As the bristles are cut cleanly there is far less likelihood of them curling under the skin and becoming ingrown. And because you can get a very close shave going across the direction of growth there is far less temptation to shave against the grain. All this adds up to a far closer shaver with far fewer unpleasant side effects. What’s not to like? Surely that must be the end of the good stuff? Well…no, there are still more benefits for the skin, hair and general wellbeing! Cold water flushes toxins from the skin and reduces puffiness, particularly round the eyes. It is thought to slow down wrinkling and tones facial muscles. If you also use it to rinse your hair after washing it closes the cuticles leaving the hair looking shinier. There are wellbeing and health benefits as well, although these are more generally associated with cold showers, or ending a hot shower with an icy blast. Cold stimulates noradrenaline secretion in the brain which improves mood disorders. It can also strengthen your immune system, increase testosterone levels, make you more fertile and even, by increasing your metabolism, help you lose weight. Wow… why aren’t we all doing this? I’m not going to claim that Ice Cold Shaves are going to replace the Traditional Hot Towel Wet Shaves. In reality the number of cold shaves you do will be small compared to the hot ones. However, I think it is always useful to be able to introduce your clients to something new and from a business point of view it’s important to keep customers (old and new) interested. Even something as simple as a blackboard outside on hot days saying ‘Ice cold Shaves today’ or offering a Hangover Buster (cold shave and black coffee!) can create a stir locally. If you do decide to try out Ice Cold Shaves, and I hope you do, then please let me know how you get on with it. And if you have any questions about this, or shaving in general, just let me know.